Total L = 190, Bell L = 153.5, W = 134.8, Depth = 96.7, th walls = 3; suspension loop diam = 64.3, W = 6.3, th = 6 mm; clapper L = 105, diam = 14.5 mm [RTS 7/12/2004]. Iron bell made from 4 separate parts. These consist of a body formed from a rectangular sheet of iron, folded over double, and the long sides heated and hammered together. The top and sides have been flattened, but the central part of the body forced open, creating an an almost cylindrical hollow interior that is lentoid in section and that widens as the bell body splays out towards its mouth. The upper part of the body has been pierced for a suspension loop, with holes in the shape of an inverted keyhole, distorted around their lower parts. A large ring has been fitted through these holes in the form of an iron rod, bent into a loop with overlapping ends. A smaller but similar loop hangs down from this, inside the body, to which the clapper has been attached. This is made from a thicker iron rod, round in section, that tapers towards the top, where it has been bent over the smaller ring, and then doubled over to run alongside the body, closing the loop and preventing it from slipping off. This clapper extends to just inside the lip of the bell mouth, and has a flat underside. The object is complete and intact, but has some surface rust making it currently a reddish brown to grey colour (Pantone black 4C). It has a total length of 190 mm; the bell body is 153.5 mm long, 127 mm wide across the top and 134.8 mm wide and 96.7 mm deep across the mouth opening, while the metal is 3 mm thick; the suspension loop has a diameter of 64.3 mm and is 6.3 by 6 mm thick; the clapper is 105 mm long and has a diameter of 14.5 mm. The bell has a weight of 1100 grams. Collected by Percy Horace Gordon Powell-Cotton and his wife Hannah at Fanamweir on 3rd May 1933, during a shooting expedition. They give the Dinka name for this type of object as lut. While the term lut does not appear in Nebel's dictionary as a bell (he describes it as 'to become red (tanning)', there is a similar word that may be the one Powell-Cotton meant; Lôth, which Nebel defines as ‘bell’ (Nebel 1979, Dinka-English Dictionary, p. 52). For a similar, but slightly larger Dinka bell, see 1979.20.103; for the type of collar used to hang such bells around the necks of cattle, see 1979.20.93. Comparable bells are also found in other cultures, such as the Ganda of Uganda; the Acholi also use this type as cow bells (M. Trowell & K.P. Wachsmann, 1953, Tribal Crafts of Uganda, pl. 77I; p. 327). Cattle bells were an early trade item in the Sudan; Petherick notes that this was one of the things the Shilluk received from Arab traders in exchange for slaves and ivory (J. Petherick, 1861, Egypt, The Sudan and Central Africa, p. 351). This object is currently on display in the Court, case 76A. Accession Book Entry [p. 248] 1934 [insert] 8 [end insert] - MAJOR P. H. G. POWELL-COTTON , Quex Park, Birchington, E. Kent. Specimens collected by himself & Mrs Cotton, during hunting trips, 1933, viz: - From the DINKA tribe, FANAMWEIR & KORNUK, WHITE NILE [...] [insert] 14 [end insert] - Lut , iron cattle-bell, ib[idem] [FANAMWEIR] 2398. Card Catalogue Entry - SUDAN, WHITE NILE, FANAMWEIR, DINKA TRIBE 2398. Lut, iron cattle bell. Coll. by donor and his wife during hunting trips, 1933. d.d. Major P.H.G. Powell-Cotton, 1934. Related Documents File - Typewritten List of "Curios Presented to Dr. Balfour by Major & Mrs. Powell-Cotton. Dinka Tribe". 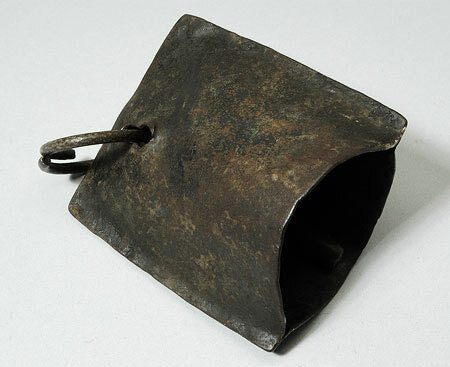 This object appears as item 2398: "Cow bell, iron, native name Lut , 3/5/33 Fanamweir, 8.55 N, 28.42 E". Also contains details of a cine film 'some tribes of the Southern Sudan', taken by Powell-Cotton during this 1933 expedition, copies of which are now in the National Film and Television Archive and the Powell-Cotton Museum in Kent [RTS 14/3/2005]. Pre-PRM label - 2398 D [rectangular collector's tag of reused brown card, tied to object; RTS 6/12/2004]. Old Pitt Rivers Museum label - (2398) Lut , iron cow-bell. DINKA, FANAMWEIR, WHITE NILE. 8° 55' N., 28° 42' E. d.d. Major Powell-Cotton, 1934 [Rectangular metal edged-tag, tied to object; RTS 6/12/2004]. Sparks, Rachael. "Dinka bell" Southern Sudan Project (in development). 03 Jan. 2006. Pitt Rivers Museum. <http://southernsudan.prm.ox.ac.uk/details/1934.8.14/>.